TOKYO—Floyd Mayweather’s over-stated arrival to his unveiling as the new figurehead for a Japanese mixed martial arts promotion proved that no-matter what the event or the location, the American boxing legend will always be box office. The undefeated 41-year-old announced he was coming out of a retirement on Nov. 5, and will top the bill at the Rizin Fighting Federation’s next card on Dec. 31, in a bout against a Japanese kickboxer with the rules yet to be determined. Prior to Monday’s news conference, Mayweather gave a select number of media interviews over the weekend, but the identity of Rizin’s marquee recruit for the Saitama event had been kept under wraps. So, with the logo for Mayweather’s ‘The Money Team’ brand ostentatiously emblazoned across the room, there was a palpable sense of intrigue ahead of the American’s late arrival. When Mayweather finally appeared in front of the media in Tokyo, the American, whose boxing record is an unblemished 50-0, was far more subdued than his noisy introduction, substituting his usual bravado with a serious business-like tone. “We want to continue and I want to continue to build my relationship with Money Team Tokyo, I want to continue to come over here and bring other fighters over here,” Mayweather explained during a somewhat stilted news conference. It seems for Mayweather, who won boxing world titles at five different weight divisions, this fight is about expanding his brand and business interests overseas. “I wanted to do something different. I always wanted to display my skills outside the U.S. and be in a special fight,” added Mayweather, who has fought every one of his professional bouts in the United States. Mayweather’s latest move comes as a major shock after he announced his second retirement from the ring following his defeat of Irish mixed martial arts (MMA) star Conor McGregor in a crossover boxing match last year. However, the most stunning aspect of Mayweather’s announcement is his decision to sign with an MMA brand, having never competed in the octagon before. While boxing rules restrict bouts to the use of just punches, MMA also incorporates kicks, knees and elbow strikes, as well as wrestling, joint locks and chokes. Mayweather and his team said they were still in negotiations with Rizin over the rules and format of the fight, which should be “situated” in the coming weeks. 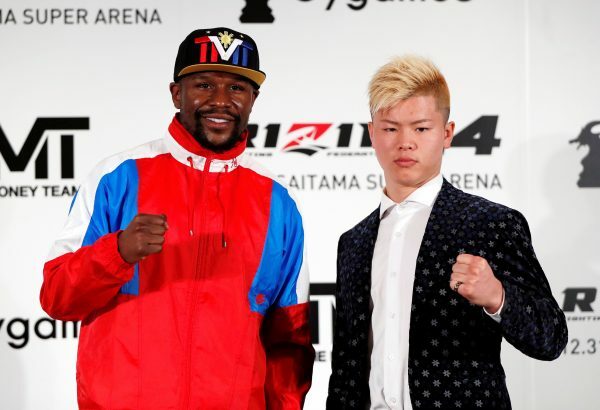 The identity of Mayweather’s opponent, Japanese kickboxer Tenshin Nasukawa—a fighter half the American’s age—muddies the waters yet further. Nasukawa competes in both MMA and kickboxing, and has won all four of his cage fights. While Mayweather showered praise on his opponent and even disparaged himself by saying “my body don’t look the same as it used to look”, a bullish Nasukawa exuded confidence. “I would like to prove with my own fist what others couldn’t do in the past,” said the 20-year-old, who added he accepted the offer to fight Mayweather without hesitation. Nasukawa’s comments caused Mayweather and his business advisor Brent Johnson to break into beaming smiles but there was a sense that in the past the former world champion would not have taken this challenge so light-heartedly. With fighting fans—both boxing and MMA alike—trying to process the latest twist in Mayweather’s career path, will primarily come down to the eventual decision over the rules of his next bout before any real judgement can be made. If this move is a bid to stay relevant, then Mayweather, whose business acumen has been matched only by his performances in the ring, has certainly found a way to keep his name in lights.